Do martial artists have to register as weapons? While I was working out at my local YMCA, a gentleman approached me today and asked me if I had to register my hands as a weapon. I answered that I had heard this before during my martial arts training in Taekwondo and MMA. I was even told that I would have to register as a weapon. (i took that as a joke.) Thing is, I had never heard of anyone ever doing this. I explained this to the gentleman posing the question. So, I decided that I would do some research.I wanted to be able to come back to that gentleman with a more definitive answer. Also, I wanted to know for myself if this was a myth, or if there was some truth to it. 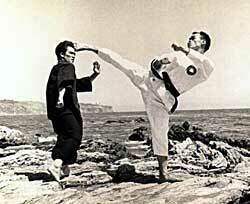 What I do know is that there are some things that martial artists should know about the law in their locations. The use of forces in most, if not all, situations in America will be scrutinized heavily in the courts. While training in ATA Taekwondo, I was instructed to use force as a last resort, only in self-defense or defense of another, and only enough to get out/get away. It did not take very long for me to find out that this is a myth. However, it was interesting to find out that this is a myth that a lot of people have believed in some way. I admit, I believed this myth, too, somewhat. Pointing back to my comments about knowing the laws in your jurisdiction, I didn't think it was a myth for a fighter - like, pro or competing - to have to register, like the boxing commission. But as I thought about it more, I found it unlikely that there would be a database of all martial artists anywhere in the world. But it was the point about use of force that made this a pressing issue. This is one of the reasons I decided to look up the answer to this question. I conflated two separate issues. My ignorance about the myth of martial artists having to register as weapons was based in part on the myth that I heard. Also, I made a gross assumption that the law in any jurisdiction would have such a requirement. While use of force is something that every person needs to be aware of (not just martial artists(, that does not mean that there is a law anywhere that requires martial artists of any degree or style would have to register their hands, feet, elbows, or any other body part as a weapon. I'm thankful for the gentleman at the YMCA posing the question. He presented me with an opportunity to learn some things about one of my passions. I just hope I can find find him tomorrow, so I can share with him what I have found. Declared "unfit for service" and overwhelmed by depression, I learned valuable lessons from the pain of it all, which I now share through my music and words.